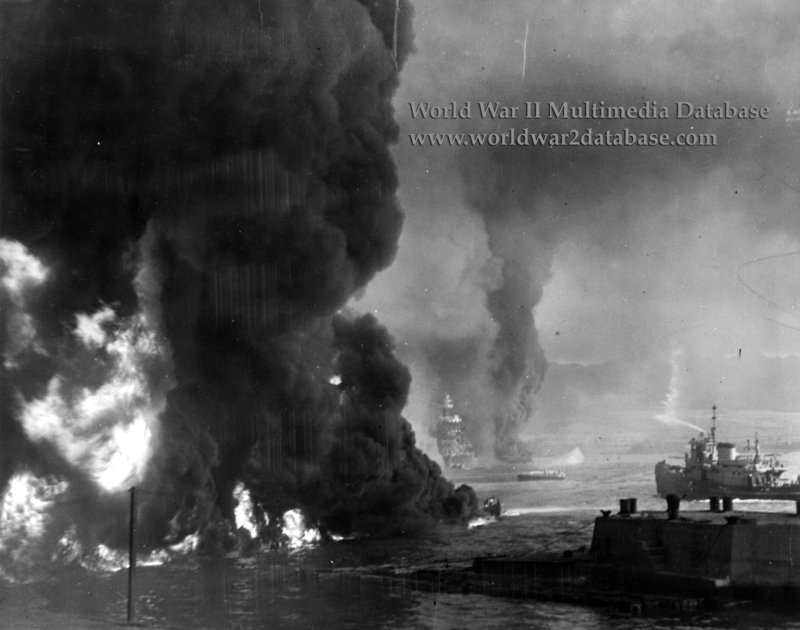 Oil fires burning on the water near Ford Island in the morning of December 7, 1941, shortly after the conclusion of the Japanese raid. USS Maryland (BB-46) is in the center background. The capsized hull of USS Oklahoma (BB-37) can be seen in the distance. A harbor tug, probably USS Nokomis (YT-142), is at right. Captain (later Vice Admiral) Homer N. Wallin (December 6, 1893 - March 6, 1984), the salvage officer at Pearl Harbor, reported in his 1968 memoirs of the attack and salvage that this view shows California was engulfed by oil fires around 1000 Hours. Lieutenant Commander Marion N. Little, First Lieutenant and Acting Commanding Officer of California during the attack, later reported: "Fire passed down the port side setting many fires on the weather decks but the ship as a whole did not catch fire. Seeing that the fire was passing I swam over from the quay to the dredge pontoons and went inshore to where a large group of men were gathered at the water's edge and ordered them to return to the ship in an attempt to salvage her. I myself returned to the quay in a punt and climbed up the mooring lines to the deck where I started to organize the personnel to fight the fires still burning amidships and to prevent the ship from sinking or capsizing."